Santa Monica's North Beach is beautiful enough, with it's surf and golden sands flanked by Malibu's mountains to the North and the world famous pleasure pier on the south. 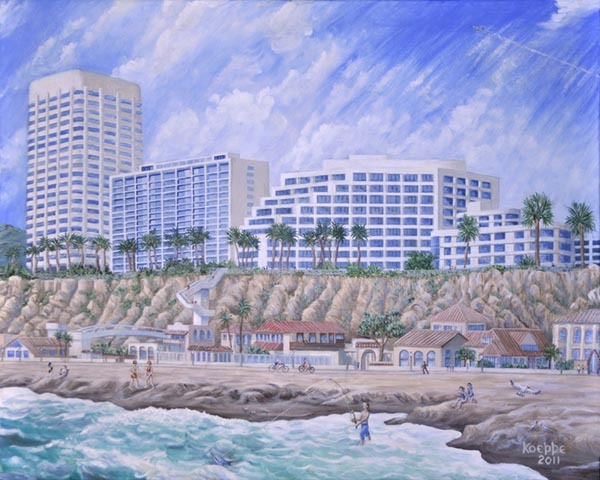 But anyone who's visited here is also "wow'd" by the 80 foot bluffs topped by Palisades Park and, along Ocean Avenue, Wilshire One, Champagne Tower, Palisades Terrace and the Shangri La Hotel. Along the west side of Pacific Coast Highway, tall and narrow ultra-modern homes now line the beach. Rather than paint those, I preferred to create my own Mediterranean-style villas. © Dada Design . All Rights Reserved.